What's so special about SGs? Discussion in 'Guitars in General' started by digthosetubes, Jun 4, 2008. Will you fans of SGs clue us in about the magic you find in these guitars? SG is to Les Paul as Tele is to Strat. I have a tele, a strat, and an LP. But tell me more, please. Not sure I can follow that line of reasoning. I'm just too dumb. They were evil before guitars were intentionally designed to look evil. But they aren't posers. You got that B.C. Rich? SGs rock! They are evil and beefy yet light as a feather. I've been playing SGs for almost 30 years. I'm short (5'6") and the body design fits me perfect. I like the upper fret access and how light they are. Here's my '67 Special. It's got P-90's, is well balanced, light in weight and comfortable to play. It sounds real good too with the P-90's. I have a question - can you SG Jr / Special Players comment on the difference between these p90 models of the SG (Junior/Special) and the Les Paul Double Cut (Jr / Special). Is the LP still thicker/beefier or does this "thinner" than a standard LP take on more of an SG sound than a Les Paul. they sound great and are very comfortable. i had a few(not at the same time) but couldn't bond with them and the reason was the fact they were neck heavy. couldn't take that neck dive. apparently some are better than others and are more balanced. I'm a P90 kinda guy. The SG is my only bucker guitar. 1 out of 9. SG Juniors are thinner sounding than LP Juniors due to the thickness of the body. I have owned many of each model. SGs...I have a love and hate relationship with them and always have. I like the looks but find them generally to be unstable platforms due to the neck/body joint. I have had vintage SGs that just won't stay in tune no matter what is done to them. I had a 62 SG reissue that was terribly neck heavy. I've had old Juniors that were nice and others that were miserable. I sold every one of them. I'm sure I'll get another someday. Probably another Junior. It's just a light Gibson that looks and sounds bitchin. What's not to like? Plus they're cheaper than an LP. So if you want approximate LP sound that won't break your back or wallett, the choice is clear. edit: More on the sound: they usually sound a lil brighter than an LP (likely due to the weight diff). So you have an excuse to have both. Who doesn't want more guitars? Tell us what you think of the tone? SGs have a thinner, brighter voice with a bit more hair around the edges. Les Pauls have more definition, more low end and a darker tone. 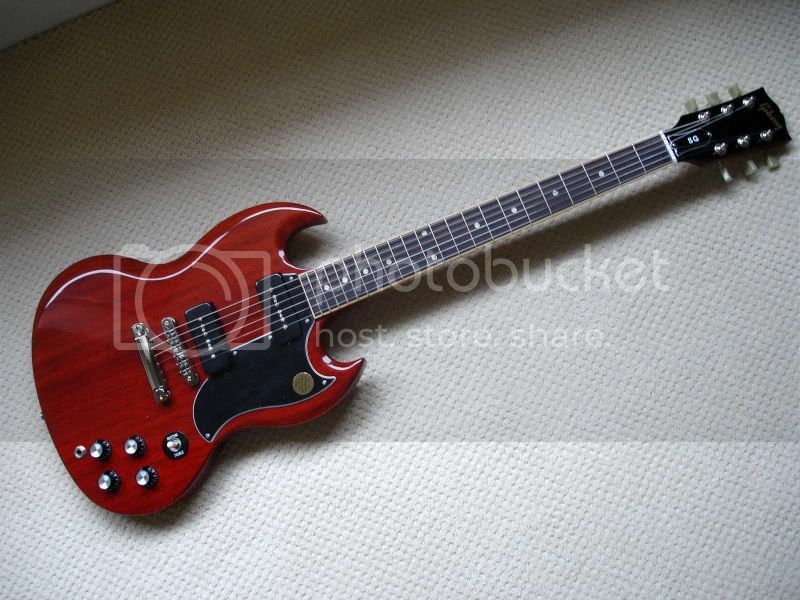 I prefer Les Pauls, but love the tone of an SG. I always thought of the SG as being closer to a Strat and a Les Paul closer to the Tele. With the exception of the brightness of a Tele, they tend to be capable of more authority and have more definition than a Strat, which has that fuzzy, less defined tone like an SG. The Les Paul is full bodied across the tonal spectrum. The SG has a certain bite to them. They tend to snarl a bit more and the neck pickup has a real woody flavor to it. Overall the tone is more focused and tighter sounding. Wonderful mids. damn now I want one!